As an avid cookbook collector, I have tried to share my love with my daughter. When I have come across a cookbook that I think she will like I try to buy it for her. Amount her collection is a cookbook called “Just 10 Minutes” it was a small little book that had really simple fair that I thought she could make on her own at college. We have been getting her ready for her big move as of late, so we thought we would try another recipe that she could do. She picked this out and was my sous chef in the kitchen. I must admit it was simple and easy, but also very tasty. Very light considering it has cream in it. Husband liked it so much he asked it to be in the rotation of dinners. For the wine I used the Cupcake Vineyard’s Angel Food. 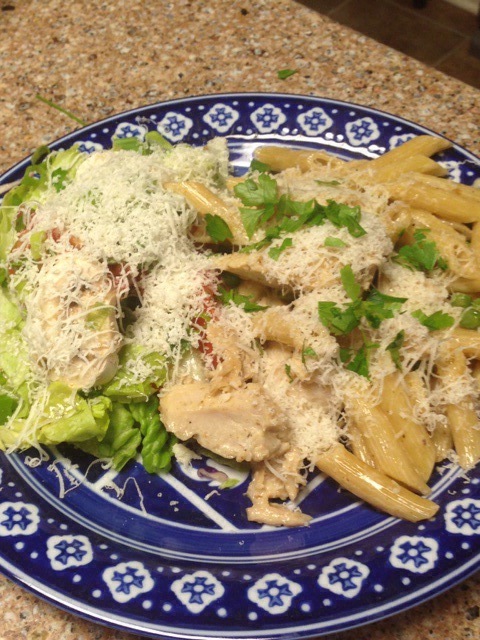 Served with a Caesar salad and fresh Parmesan cheese. Cook pasta in large pot until tender, cook chicken separately in pan with heated olive oil. Pour wine over chicken and cook on high until almost evaporated. Drain pasta and add to chicken. Add peas and cream. Stir well and cover. Simmer for 2 minutes. Serve with sprinkled parsley.